It’s the first Monday of the month and that means another episode of Stylish Mondays. The theme this month is Ladies in Red. Perfect theme for the Valentine month! 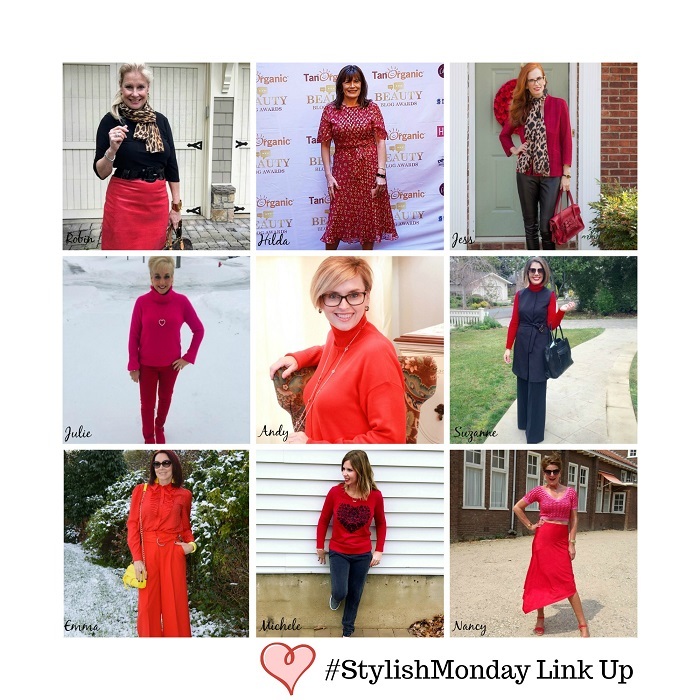 Stylish Monday is created out of a Facebook group of Life and Style bloggers over 50. (sorry Emma) Every month we interpret a theme in our own way, fashionable wise of course. It’s a fun way to be creative with fashion! And to see how other women interpret a theme chosen by someone else. It is a nice fashionable way to create something beautiful with other bloggers. Take a look at how I styled the color. I am a lady in red, more then I thought! I had in mind to show a monochrome outfit in red. Because I thought that I almost never wear red. Until I went through my photos and found out that I have quite some outfits with red. I thought it would be nice to show some of these outfits to you. It turns out that red is not one of my least favorite colors as I always said and thought. One of my favorite skirts of last Summer. A pre-loved Claudia Sträter one. 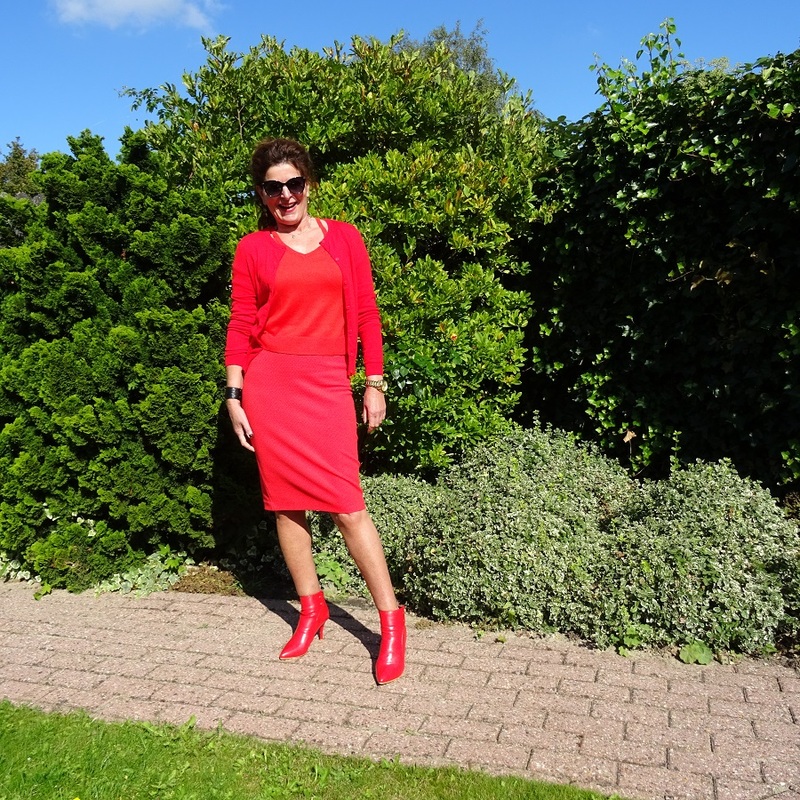 The long red cardigan with red(ish) peeptoe shoes. Fabulous combination. Red and orange! 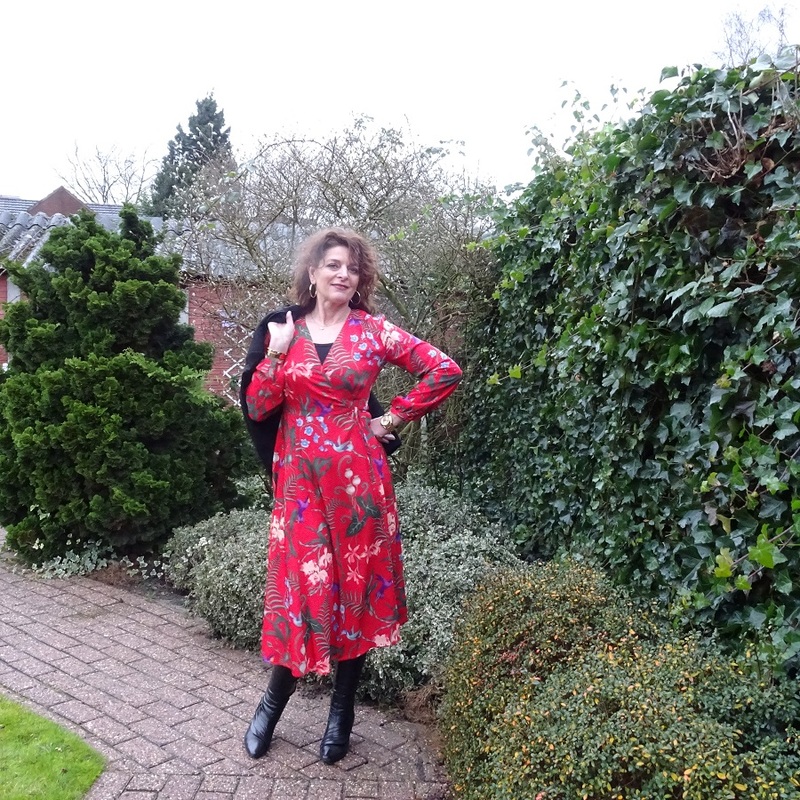 Floral wrap dress in Winter. 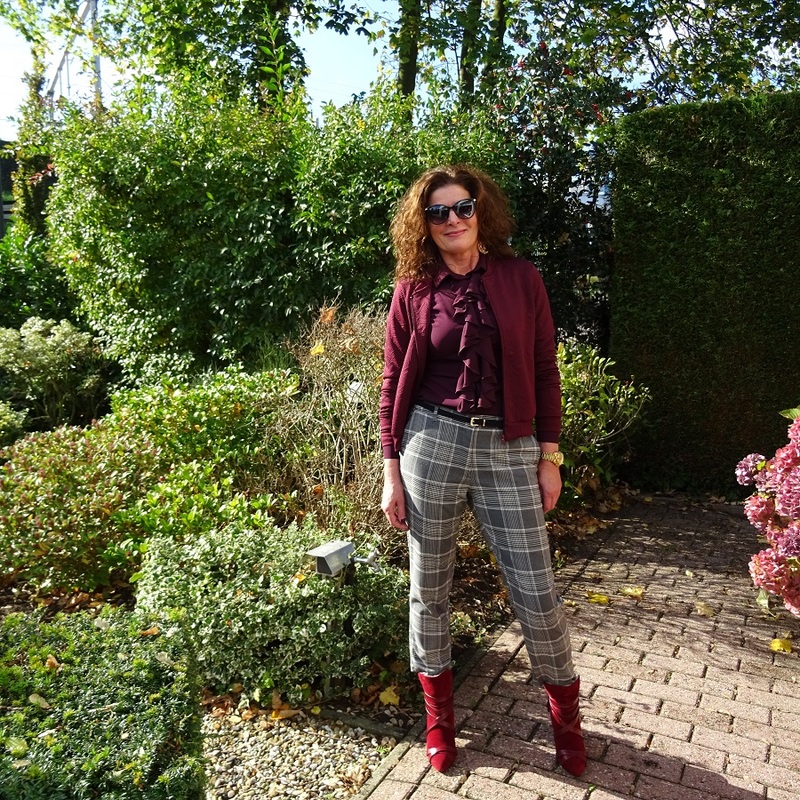 Burgundy jacket, also seen with the prairie dress, and lovely burgundy ankle boots. 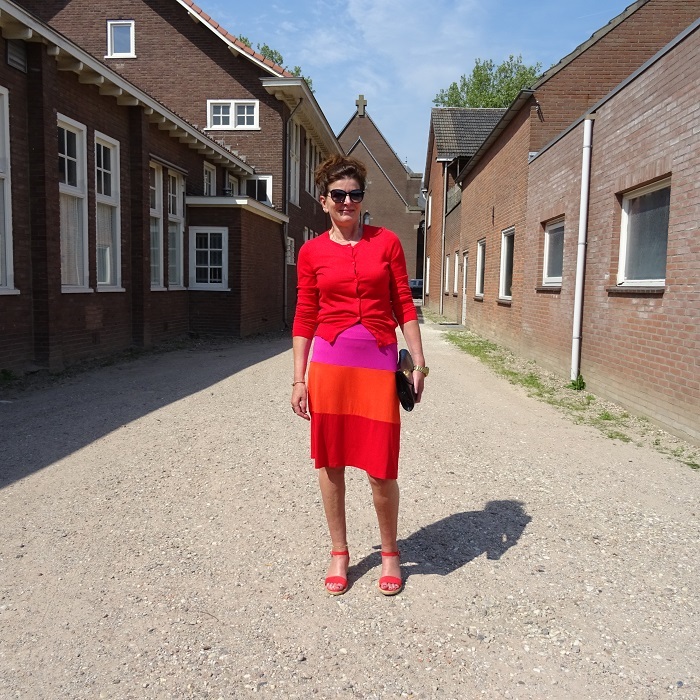 A very bold outfit from last year, over 50 and wearing a cropped top. And a total Lady in Red! What does the color red stands for? I was a bit surprised to see how much red clothing and accessories I actually have. There is something about red that I don’t like, although I think it looks good on me. I think red looks good on everyone. Red always attracts whether it is clothing, flowers. Look at all the sale signs in shops, red! It’s the color of our heart and of love! 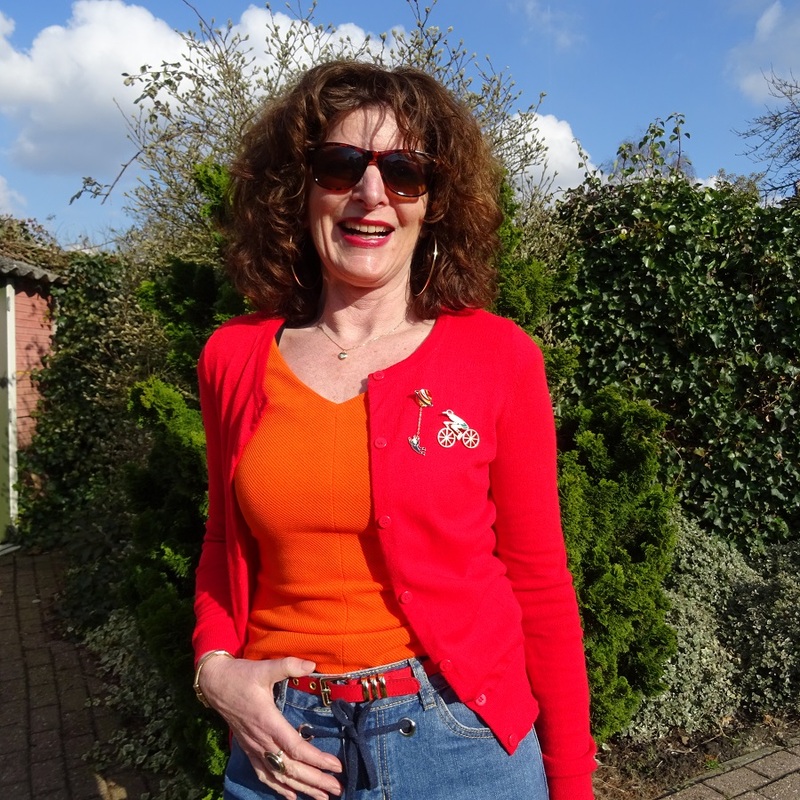 Let’s take a look at all the other Ladies in red and please visit their lovely blogs! And you can join our linkup too! Visit other bloggers posts and get to know each other! Loving all the red. So perfect for Valentines Day. Nancy you are stunning in that cropped top! I don’t know many women who can wear one but you most certainly can and look fantastic! Well thank you very much! I don’t wear it when I just had dinner! You really look great is the bright reds, Nancy!! I’m thinking you should keep it around!! Thanks Jodie! I think I will as I didn’t even realize I had that much red! I am in love with Nancy in red, and pink. I love how you mix them together. The combination looks nice. I am in love with all your red from bright to dark ones, pants to dress to shoes. Well thank you very much dearest Rama! Red is your color! I love the outfits and yes, that silk midi skirt and crop might be my favorite ! Love the red monochromatic looks too. Thanks Jess, enjoy your week! Red is a wonderfull Colour on you Nancy! Yes the KL wrap dress is my favorite too. I am now discovering Lola&Liza! Love all these red-inspired looks! That crop top one is my fave on you. Thanks for the link up! Oh wow! These are so great. I especially love the one of you in ALL red! Beautiful! I think you can totally rock wearing RED! I love all your styling options and your BOLD crop top! It’s been great collaborating; and I’m looking forward to next month’s theme! Yes me too, this is a very welcoming group! You have so many fabulous red pieces Nancy, but you should, it looks fabulous on you! Such great looks, and fun as always to collaborate with you! I love the colour red a lot. Red suits you and I’m loving the outfit with the cropped top and skirt! have a wonderful day, Nancy! But you are the Queen Martina! Nancy all the shades of red seem to suit you. Is there any shade you cannot wear? YouALWAYS LOOK FABULOUS. Haha, oh there are a lot of things I can’t wear! Thanks Hilda. Red has always been one of my favourite colours! It makes me feel cheery and powerful! You look amazing in all of your red outfits, Nancy, as do your cohorts! Sooo cute dear! Especially the first one, loving the colors. Also, cute monochrome look in the last one too. The wrap dress is my favourite! I don’t wear red a lot, but I do love it when I do wear it! It’s such a vibrant color. I really love red dresses! That color block skirt is so pretty and a lovely statement piece! Love how you styled it. Thank you very much Carrie! Thanks for sharing at Creative Mondays, hope you can join us again at another party soon.